he BioSkin Calf Skin is a specially designed calf sleeve constructed of UltimaTM material (strong, thin, moisture-wicking, neoprene-free material) which provides full length compression for both the calf and leg region. It provides excellent pain relief associated with shin splints, strains, and contusions. BioSkin Calf Sleeve products are made from a three layer fabric that is compressive, hypoallergenic, and thin for easy wear and washing. The BioSkin Calf Skin calf skin provides a firm, uniform fit and reduces pain with running activities. RECOVER - Compression helps your body recover from injury or hard workouts. 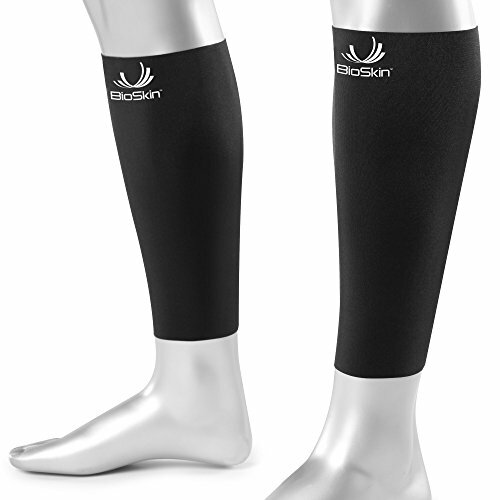 BioSkin Calf Sleeves provide medical grade compression to ease pain from shin splints and calf strains. Compression increases circulation in your legs so nutrient-rich blood flows through the injured area and lactic acid, cortisol, and other fluids can be flushed out more efficiently. PREVENT shin splints and calf injuries with the Calf Skin. Science has shown compression provides many benefits to your muscles. It enhances recovery, boosts performance, and improves proprioceptive feedback to the brain. These benefits work together to protect your calf muscles from being overworked during exercise, the main cause of injury. PERFORM - Wear the Calf Skin's to boost performance during your next activity. Compression increases circulation so more oxygen-rich blood is delivered to your working muscles. Compression also enhances recovery which in turn boosts performance by allowing you to return to activity with fresher legs. Another known benefit of compression is increased proprioception, or positive sensorimotor feedback to the brain. This helps to improve confidence and coordination of your movements. Full compression sleeves work better than shin splint wraps, taping and braces for providing uniform compression. Made with premium hypoallergenic material, designed for comfort and powerful compression to support lower leg circulation and prevent wasteful muscle osculation. If you have any questions about this product by BioSkin, contact us by completing and submitting the form below. If you are looking for a specif part number, please include it with your message.